By the time `fresh’ seafood reaches most Seattle restaurant kitchens, it’s anything but fresh because it’s likely spent several days in transit on fleets of large fishing vessels. Here at 190 Sunset, seafood travels from the sea to your plate within 24 to 48 hours. How do we accomplish this? First, we’ve built long-term relationships with members of the seafood industry. Secondly, we support managed fisheries that ensure the long-term sustainability of wild and natural fish stocks. Finally, we purchase from fishermen and their families, which contributes to the economic stability of local communities. These fishermen fish in small boats that are generally in the 65-foot size range. The boats are often operated by husband and wife teams who are very proud of all the fish they catch in the old fashion way – with a hook and line. These small vessels make shorter trips and smaller catches, which results in extremely high-quality seafood. Each fish is immediately handled and cleaned on board the boats before being Fed Exed out to 190 Sunset. And we can make the freshest seafood available for each and every guest. From the grilled wild Alaskan salmon and fresh pan roasted halibut, to 190 Sunset’s famous Dungeness crab cakes – each seafood dish on 190 Sunset’s menu represents Tom Budinick’s highest commitment to quality. A commitment that’s an extension of his family’s fishing heritage. The proprietor of 190 Sunset comes from a long line of fishmongers who’re now part of Seattle’s famous seafood lore. Back in the early 1900s, Tom’s grandfather Martin Budinick ran Rainier Fish Company, a seafood marketplace that was located at 6th and Olive, near the current site of downtown Nordstrom. An archival photo of Tom’s grandfather displaying freshly-caught fish at his market, hangs in the restaurant’s entryway. Also, Tom’s uncle owned and operated two fish markets in the Seattle area: American Fish Market and Pure Food Fish Market. The latter business still thrives today in the heart of Seattle’s Pike Place Market. The family lived in Queen Anne, which was home to a large community of Croatian immigrants who earned their living going to door-to-door, selling fish to nearby owners of mansions along Highland Drive on Queen Anne Hill. Tom continues his family’s seafood legacy by owning and operating 190 Sunset, one of the newest and most popular seafood restaurants in Edmonds. Tom is by no means new to the restaurant business. At age fourteen, he began a ten-year run at Ward Enterprises which at the time owned the enormously popular 13 Coins and the original El Gaucho. From there he joined Restaurants Unlimited which owns some 50, mostly waterfront restaurants including Palisades and Cutters Crabhouse. 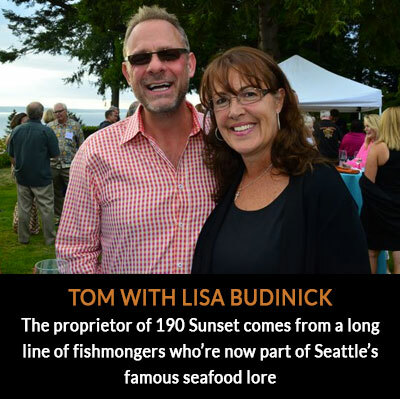 Tom opened 190 Sunset in Edmonds with the goal of serving the freshest seafood you’re likely to find anywhere in the greater Seattle area. Try his signature Crab Cakes (they outsell everything else on the restaurant’s menu 3:1), or the Pan-Seared Scallops, or the `Nacho Average’ Ahi Poke Nachos. Tom Budinick’s kitchen is not your average seafood kitchen – not by a long stretch. Because fish isn’t just food at 190 Sunset. It’s tradition, inspiration, commitment, and a way of life. Best Happy Hour in Edmonds? 190 Sunset of Course!